JackGas is a new and revolutionary way of conveniently having your propane tank refilled without having to leave the comfort of your home or office. JackGas.com is a division of a large and successful family owned propane company that has been in business since 1969. Using current technology, we are able to make deliveries quickly and efficiently across a wide geographical area. GPS mapping makes it possible to create the most fuel efficient delivery routes saving on gasoline and creating a healthier environment for us all. Upon delivery, our driver takes a picture of your newly delivered tank with a tablet and emails it to you immediately confirming time and location of delivery. At JackGas.com we want to keep you as a customer for life. That is why when we fill a twenty pound BBQ tank, we have made the decision to fill it all the way with 20lbs. of propane. Although this sounds simple, it is a fact that the other major exchange companies are only filling their tanks 3/4 of the way with a net weight of fifteen pounds of propane. After you order your first tank you will see that out tanks last longer than others and ordering can't be easier. So order now and be among the first to try a new concept because five years from now everyone will be ordering their propane this way! 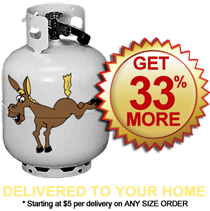 20 lbs of propane gas delivered to your door!